Over 30% of the total service calls are related to the last 200 feet. For a broadband network of 1 million subscribers, that means that approximately 90,000 service calls a year are related to this segment of the network. At roughly $75 per service call, that means a cost of $6.75 million. With a slight capital investment in connectors and cables, and a slight investment in training, this cost can be reduced significantly. Furthermore, approximately 20% of repeat trouble calls (those within 30 days) result in churn of customers to competing providers. By investing in quality components and proper training, you save dramatically in operational costs AND you retain customers. 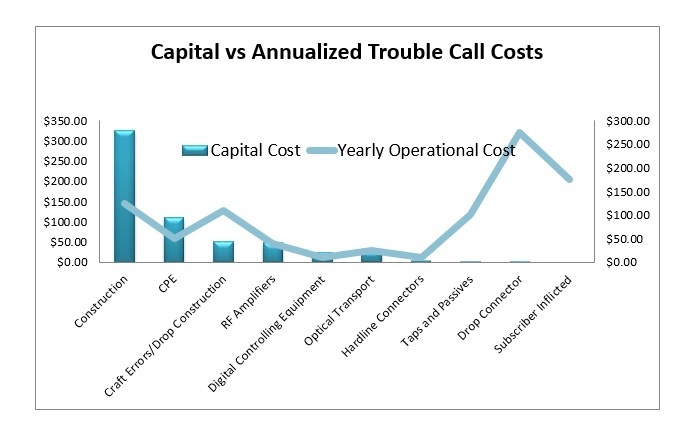 The chart below shows costs incurred in different parts of the network. 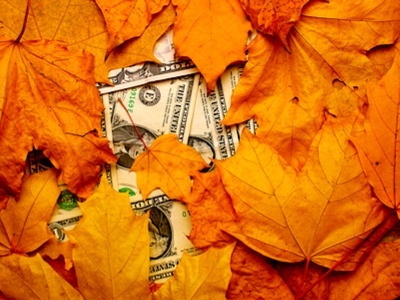 Training is an often overlooked expense that should be accounted for in TCO calculations. But it is the type of expense that actually saves money in the long run, reducing the TCO figures. There is no doubting that expert training in proper preparation and installation procedures is beneficial, but there is also increasing recognition that training needs to be regular and ongoing. Continuous training serves the TCO in two important ways. Firstly, with the ever-increasing emphasis on the need for higher integrity networks, there is a real benefit to having a workforce that understands the latest installation techniques, tools and products. Secondly, the high rates of installer turnover, clearly costly in the long run, could be abated by investing in long-term training programs. By empowering staff to continually improve, they are more invested in the organization and will likely stay longer. The danger of buying on price alone, combined with an improperly trained workforce, is that significant costs can be accrued in a long list of different areas. Technicians need consistent training that is focused on reducing installation errors. This would result in fewer service calls and fewer repeat calls to the same customers. More and more, the customer-premises equipment installed using DOCSIS technology can be accessed by remote management systems, to check the performance of their internal networks. PNM or proactive network maintenance uses algorithms and equalization signals to determine the precise location of network faults affecting the quality of service. Without the proper training and these kinds of checks in place, faults in the network that originate at the premise and migrate back to the headend are difficult to locate. And these faults don't affect only the subscribers, where they originate, but also many other subscribers in the return path back to the headend. In-field failure can be exacerbated through the use of or pre-existing inferior connectors and cabling, which can result in a subscriber-generated service call. If a customer moves the modem, television or furniture and a poorly-fitted cable comes loose, to then be improperly re-fitted by the customer himself, a service call could happen. The largest fault with standard connectors that are loose is one of ingress and egress. Without continuity to ground, these connections act as a major source of RF interference. Motor noise from household appliances and motor driven devices are a common cause of this interference, as are external networks utilizing common frequencies, such as cellular LTE. Finally, issues around maintenance, repair, lack of training, and unnecessary service calls only become more severe with larger, lengthier installations, which are becoming more prevalent as demand for broadband access spreads. What does this suggest? Proper training for installers can go a long way to reducing the ongoing operational costs inherent in running a broadband network. And the added expenditure for a regular training program is outweighed by the resulting reduction in the total cost of operating the network. So, as stated above, a slight capital investment up front can save dramatically on operational costs and subscriber churn in the network.